The Omani Embassy in Seoul launched its annual program “Welcome to Oman,” aimed at promoting understanding between the peoples of Oman and Korea through the exchange of knowledge, the arts, tourism and business. At the inaugural event at the diplomatic mission on Friday, 26 students from Hankuk University of Foreign Studies, Myongji University, Dankook University, Chosun University and Busan University of Foreign Studies participated. Twenty of the students will visit Oman soon to study the Arabic language at Sultan Qaboos College, which offers language education to non-Arabs. 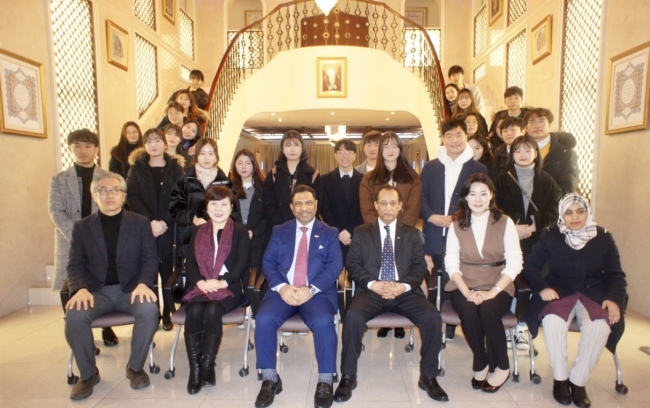 “This year’s public diplomacy program will focus on a series of cultural and artistic activities, including lectures at the embassy and Korean schools and universities, as well as exhibitions, performances, tourism promotional events and investment seminars,” said Omani Ambassador to Korea Mohamed Alharthy. The envoy is also the dean of the Diplomatic Corps in Korea and president of the Korea-Arab Society, the latter of which celebrates its 10th anniversary this year. During the lecture at the embassy, the ambassador highlighted Oman’s historical and cultural heritage as an Islamic nation on the southeastern coast of the Arabian Peninsula. He also touched on bilateral relations, which have moved forward comprehensively since being established in 1974. Oman is a nation of intercultural understanding, tolerance and coexistence, Alharthy noted, adding that diverse religions are practiced there in peace and harmony. The diplomat also introduced Sultan Qaboos College and its Arabic education program centered on linguistic as well as cultural learning and exchange. The students toured the elegantly decorated embassy, browsing through various pictures and artifacts that illuminate Oman’s rich cultural heritage, history and calligraphy. At a press conference in December marking the 10th anniversary of the Korea-Arab Society, Alharthy noted that Arab countries are moving beyond the oil and gas industries to diversify and innovate their economies. This is where the next wave of global cooperation in commerce and culture can occur, he argued, urging Korean and international partners to explore new opportunities across Oman and other Arab countries. “Most Arab countries, including the oil-and-gas-dependent Gulf Cooperation Council member states to which Oman belongs, lately launched a strategy of economic diversification, focusing on logistics, information communications technology, manufacturing and industry, health care, agriculture, fishery, education and tourism,” he said at the embassy.